Hundreds of hours of intense listening reveal the secretive communications of the Pacific’s smallest baleen whale. The world’s oceans are full of loud and complex noises caused by everything from shipping to pile driving, seismic surveys to military sonar. Marine mammals are also capable of some amazingly powerful sounds—be it the haunting calls of a humpback whale or the rapid-fire echolocation of a hunting killer whale. But there are also fascinating sounds in the ocean that are far more cryptic, requiring hundreds of hours of intense listening to detect at all. For example, those of the little-studied minke whale of the northeast Pacific. “Minke whales on this coast are like the unspoken whale, the girl next door of whales, because they’re not terribly charismatic and don’t spend a lot of time on the surface doing cool things,” says Katrina Nikolich, a doctoral student specializing in bioacoustics at British Columbia’s University of Victoria. The minke whale is the smallest baleen whale in the North Pacific. Adults grow to 8.5 meters, which is diminutive compared to a 22-meter blue whale. A minke whale feeds by filtering small fish and invertebrates from the water. “They are one of the most frustrating animals to study,” says Nikolich, noting minkes surface quickly and display little of their backs before diving in unpredictable directions. Nikolich led a recent study investigating the communications of six minke whales (specifically, the subspecies Balaenoptera acutorostrata scammoni) that foraged in the summer of 2012 in the relatively shallow waters of Cormorant Channel off northeast Vancouver Island, British Columbia. For 568 hours over 56 days, 12 volunteers assisted Nikolich and her colleagues by peering out over Cormorant Channel through binoculars looking for minke whales, while a fixed hydrophone and acoustic recorder positioned just offshore eavesdropped on underwater sounds. The researchers had high hopes for capturing the first minke vocalizations in this part of the world, but when they investigated more than 64 hours of recording data, they couldn’t attribute a single sound to the elusive animals. Undaunted, the team refocused its efforts on those times when minke whales were observed closest to shore. After a lot of second-guessing, the researchers concluded they had documented two faint minke calls—both new to science. One was a quick, low-frequency call that Nikolich describes as a “short-duration grunt.” The other was a mid-frequency call that resembles someone running their fingers down the tines of a comb. What the calls mean is another question. Nikolich suspects the whales use these specific calls for socializing, rather than mating purposes. They keep the calls quiet and infrequent to avoid attracting their main predator—mammal-eating transient killer whales. “Transient killer whales will listen for the sounds of their prey,” she says. Female minke whales are thought to produce fewer calls than males, based on research of other baleen whales. Biopsies on two of the six whales in this study confirmed them to be females. And Nikolich is also aware of eight female minke whales that have floated ashore dead in British Columbia and Washington. Currently, minke whales are considered a species of least concern by the International Union for Conservation of Nature and researchers hope to keep it that way. These latest findings on vocalizations are part of a growing baseline of information being collected on the animal. Greater shipping traffic in years to come could increase the whales’ vulnerability to underwater noise and vessel strikes. “We now know what to expect to hear when they’re around in an area,” Nikolich says. Those not directly associated with the study are buoyed by the findings. Tom Norris, chief scientist with Bio-Waves Inc., a California-based company conducting marine bioacoustics research, including on minke whales in Hawai‘i and the Northern Mariana Islands in the Pacific, suggests this is only the beginning of unraveling the lexicon of minke whale conversation. Larry Pynn is a veteran environmental journalist who has received some 30 awards for his newspaper and magazine writing, including eight Jack Webster Awards. He has written two non-fiction books (Last Stands and The Forgotten Trail), and is a member of The Explorers Club. 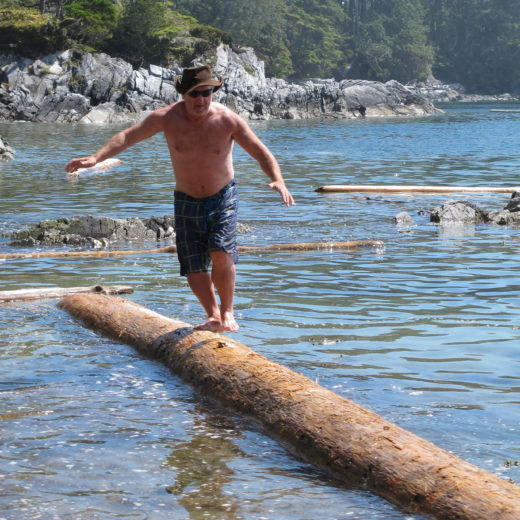 He lives in Maple Bay, British Columbia, and loves all things ocean—be it seafood, kayaking, hiking a coastal trail, or trying his hand (feet?) at impromptu logrolling. Cite this Article: Larry Pynn “Wiretapping Minke Whales,” Hakai Magazine, Feb 1, 2019, accessed April 26th, 2019, https://www.hakaimagazine.com/news/wiretapping-minke-whales/. Is this where North Pacific humpback whales practice their songs? Our interactive sound map explores the busy marine soundscape, from kayaks to cruise ships.